Mission bookcases are a great addition to any office, study, den or living room. A beautiful bookcase could be the eye-catching piece of furniture needed to make your home stand out. Bookcases can serve many purposes in your home beyond storing books. They can display your valued family pictures, your hard-earned trophies, your favorite decorative items and almost anything else you choose to store. Mission bookcases have great functional and organizational purposes, but they also provide a fashionable addition to your space. Mission style furniture originated in the 19th century and is known for its simple design. 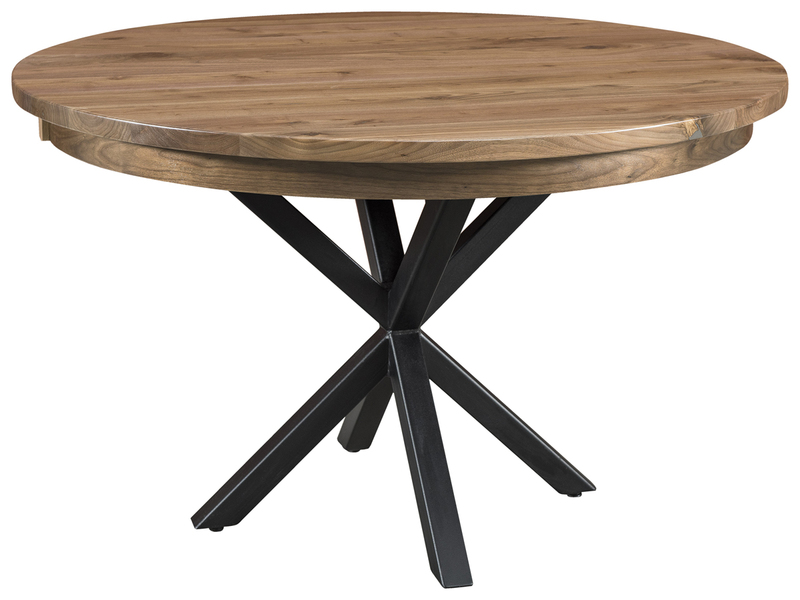 Straight lines and hard angles draw attention to the beautifully stained natural wood grains. Mission furniture complements many different furniture styles, which is why it’s still a popular choice today. 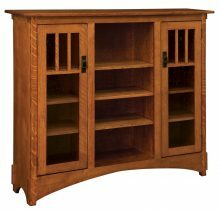 Our Mission bookcases are crafted from solid, kiln-dried hardwoods. This ensures a sturdy, durable piece that will withstand everyday wear and tear for so long you’ll be able to pass these Mission bookcases down to children and grandchildren. 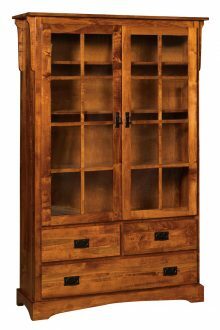 Customize the appearance of your Mission bookcase by choosing from our variety of wood types and stain colors. 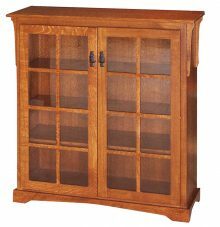 We offer most bookcases in oak, cherry and Q.S. white oak. We also have a large selection light and dark stain colors so you can find a perfect match for your existing furniture. With our wide range of Mission bookcases, you can choose from an open-shelf design, a design with doors or a combination of the two. Finally, you can customize the layout of the bookcase using our adjustable shelves. You can coordinate our Mission bookcases with any piece of furniture in your home — they’re especially great as complements to our Mission style office and living room furniture. Each piece is available to be purchased individually to ensure you can design your perfect space. Purchase a high-quality Mission bookcase from AmishOutletStore.com and you can receive up to 33% off the retail price. Each piece is handcrafted by expert Amish crafters to ensure it will last for years to come. Find a beautiful and versatile bookcase to add to your home. Explore our full collection of Mission bookcases today! 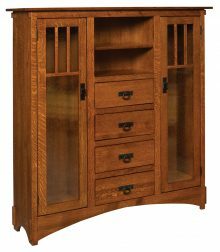 I ordered the West Lake TV Cabinet in oak with a golden/reddish hued stain for my parents as a Christmas gift. It was recently delivered and surpassed my already high expectations. The cabinet arrived in perfect condition, beautifully made with attention to detail. Just opening the drawers shows the quality of this custom made piece. The weight is substantial, sturdy and impressive in every. Every employee with whom I communicated with via telephone and email were very friendly, courteous and professional as were the two great guys who delivered the furniture. I do not typically write reviews but had to share this wonderful company with others. Amish Outlet Store makes beautiful quality custom furniture. You may have to wait a bit for your piece to be crafted but it is well worth the wait. All that and Made in USA! Very pleased & highly recommend!